The United Nations Security Council has called on Libyan army commander Khalifa Haftar to halt his forces' advance toward Tripoli, which is under the control of a UN-backed government. After an emergency meeting on April 5, the council warned that the military activity of Haftar’s Libyan National Army (LNA) was putting the country’s stability at risk. German Ambassador Christoph Heusgen, who currently holds the Security Council presidency, told reporters following the closed-door session that the council "called on LNA forces to halt all military movements." The council said it would hold accountable those responsible for any further violence. The council’s statement came hours after UN Secretary-General Antonio Guterres met with Haftar in Benghazi as part of efforts to forestall an outright assault on Tripoli and avoid a bloody civil war. "I leave Libya with a heavy heart and deeply concerned. I still hope it is possible to avoid a bloody confrontation in and around Tripoli," he said on Twitter after his meeting. Before the meeting, he tweeted: "My aim remains the same: avoid a military confrontation. I reiterate that there is no military solution for the Libyan crisis, only a political one." Guterres has also been in Tripoli this week to help organize a national reconciliation conference planned for later in April -- a plan that looks increasingly unlikely with every day of continued fighting. Earlier, foreign ministers from the Group of Seven (G7) industrialized nations interrupted a meeting in France to express their "deepest concern" about the renewed fighting and urged an immediate end to military activity. Russia, which has provided Haftar with backing in the past, claimed it was not helping the commander’s forces in the offensive and that it supported a negotiated political settlement that ruled out any new bloodshed. Haftar’s LNA on April 4 launched the offensive aimed at taking the capital. Reuters and other news agencies said Haftar’s forces took the town of Gharyan, about 80 kilometers south of Tripoli after fighting aganst forces allied with Prime Minister Fayez al-Serraj, who is based in Tripoli. Tripoli-allied forces also reportedly took dozens of soldiers from Haftar’s units prisoner in a town west of the capital. Late on April 5, area residents said fighting was going on near the former international airport outside Tripoli and that the LNA had taken control of the facility. 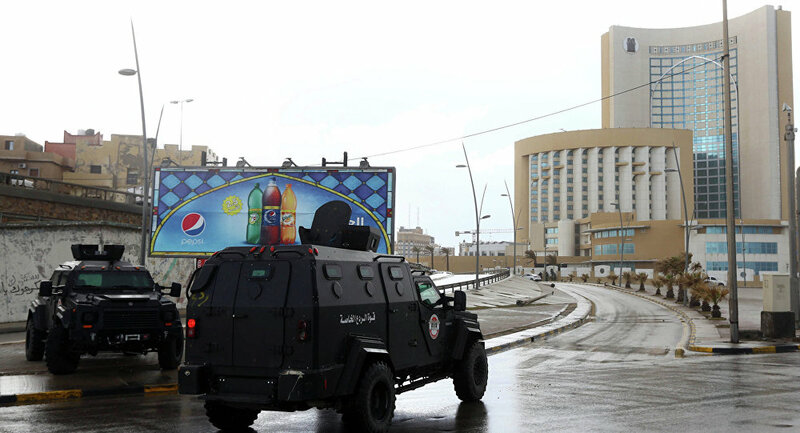 The Tripoli-based interior minister, Fathi Ali Bashagha, later said central government forces had retaken the airport.